There is an audio player graphic beneath the interviewee name link below. You may need Quicktime or another media player installed to use it. Click on the play arrow; this will stream the podcast without downloading the file. If you cannot see the graphic just click on the interviewee name link. Mac (Safari): Option-click on interviewee name link. See the Technical Page for more information. 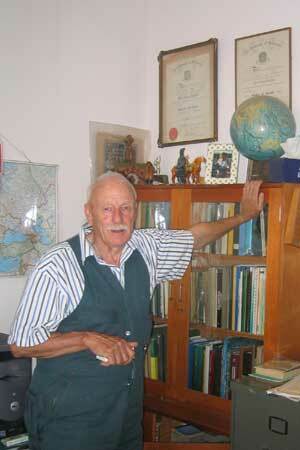 The late Jack Douglas was a geologist, palaeobotanist and sportsman. He was a major figure in the Geological Survey of Victoria, co-editing The Geology of Victoria and overseeing production of the first 1:250000 geological map series. He gained international recognition as a palaeobotanist and palynologist. In his student days he played a couple of seasons for Hawthorn at centre half back, and represented Australia in international athletics tournaments. After beating John Landy in a 440 yard race he almost made the 1956 Olympic team. He was a long-serving member and president of the Field Naturalists Club of Victoria and a great family man. This interview was conducted with the participation of Doug McCann. This interview © Copyright Jack Douglas, Doug McCann & Craig Robertson, 2004. Note: An article based on this interview was published in VAST (Voices of Australian Science & Technology), by The Royal Society of Victoria. Obituaries for Jack Douglas were published in The Age 1 March, 2007, by Anne Douglas, and The Victorian Geologist, April 2007 newsletter, by Fons Vandenberg et al, published by the Geological Society of Australia, Victoria Division. Debussy Mouvement from the suite Images (I) played by pianist Stephen McIntyre, on his album The Impressionists © 2000; D. Scarlatti Sonata in C (K. 420) played by Jacqueline Ogeil on her album The Virtuoso Harpsichord © 1995; Debussy La fille aux cheveux de lin played in its entirety by violinist Miwako Abe accompanied by David McSkimming, piano, on their album Poeme: Music for the romantic violin © 2000. In my study: notes on collecting stones; favourite stones; geology as literature; see In my study No.4 (2 Mb; 4' 23"). See: Basin and Range by John McPhee (Noonday Press, New York, 1980). The Otway Basin of South-eastern Australia, eds. J.G. Douglas (contributor) and H. Wopfner, Special Bulletin Geol. Surveys South Aust. and Victoria, 1971. Jack Douglas also edited and published various conference proceedings, geological maps, dozens of scientific papers and articles in scientific and popular journals; his main subjects were geology, palaeobotany and palynology, palaeontology and palaeoclimatology. Information on this page may be accessed and read or listened to for personal use. The material may not be copied or communicated to other parties without permission.